An RIT esports team is ranked as one of the top collegiate Dota 2 teams in North America, making it to the finals of the AVGL and CSL college championships in April. A team of Rochester Institute of Technology students has become one of the best collegiate Dota 2 teams in North America, making it to the finals of two national championships. On April 15, the RIT esports team was flown out to compete in the finals for the American Video Game League’s (AVGL) April Anarchy, a national collegiate esports championship hosted in Long Beach, Calif. Playing in front of an in-person and online audience, RIT was beat by a student team from University of British Columbia. For second place, the RIT team won $3,000. On April 28, the RIT team is heading back to California to take on McMaster University in the final four of the Collegiate Starleague (CSL) Grand Finals. The winner of that match will face the winner of University of California, Davis vs. Stony Brook University. The top team will win $10,000. “The tournaments are a great experience because not only do we get flown out to LA, but we are treated like celebrities,” said Reed Cogliano, a second-year computer science major from Carlisle, Mass. 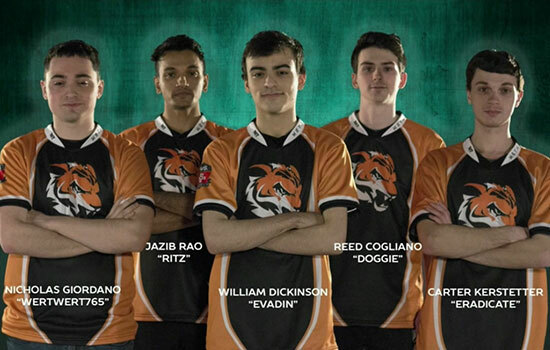 The RIT Dota 2 team includes Cogliano; Nicholas Giordano, a third-year software engineering major from Warren, N.J.; Benjamin Morgan, a fourth-year game design and development major from Peru, N.Y.; Jazib Rao, a third-year management information systems major from Queens, N.Y.; Will Dickinson, a fourth-year game design and development major West Hartford, Conn.; Carter Kerstetter, a fourth-year computer science major from Lewisburg, Pa.; and Sam Belisle, second-year game design and development major from Shelburne, Vt.
To make it to each final, the RIT Dota 2 team played through a season in each league. In AVGL, the championship bracket consisted on eight teams, while CSL’s bracket consisted of 32 teams. The RIT team practices about four times a week, depending on how busy they are with classes. According to the RIT team, what makes them successful is their different playstyle. To learn more about RIT esports, go to esportsrit.com.